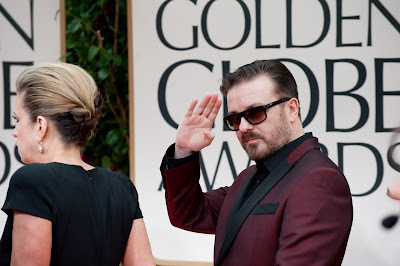 Host of the 69th Annual Golden Globe Awards, Ricky Gervais arrives at the Beverly Hilton. The Descendants or The Artist. Clooney or Dujardin. Streep or Williams. Only one of the two in the three duos will be victorious. The journey to the Oscars has begun, with the 69th Golden Globe Awards ceremony that took place on 15th January 2012, at the Beverly Hilton Hotel in Beverly Hills. 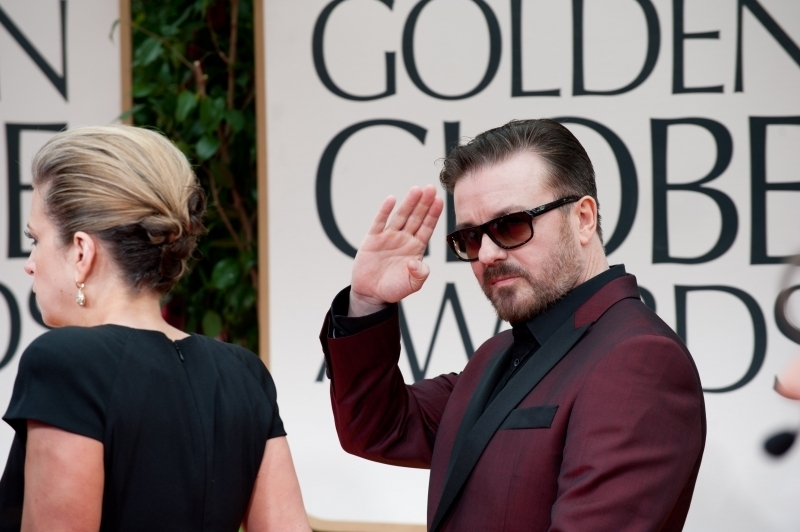 The Golden Globe Awards are the second biggest awards in the world, honouring the best in film and television annually. The ceremony was hosted by prominent British comedian Ricky Gervais, who delivered a mind blowing opening monologue and performance. · Best Original Song: Masterpiece – W.E. The presenters of the awards included award nominees and winners from the previous years, such as Johnny Depp, Robert Downey Jr., Tina Fey, Emily Blunt and Reese Witherspoon. One of the highlights of the ceremony was Meryl Streep’s use of profanity in her acceptance speech, continuing the trend that actress Melissa Leo started in the Academy Award ceremony, where she won the Oscar for Best Supporting Actress. Matt LeBlanc’s win is a sure resurrection of his flailing career, which became dormant until his regular appearance the TV series ‘Episodes’, where he plays an exaggerated version of himself. The Cecil B. DeMille Golden Globe Award for 2011 was awarded to American actor Morgan Freeman, for outstanding contributions to the world of entertainment. The Academy Award nominations for achievement in film for 2011 will be announced on the 24thJanuary, and the ceremony will take place on the 26th February 2012 at the Kodak Theatre in Hollywood, California. American comedy actor Billy Crystal will be hosting the ceremony for the ninth time.